block, as shown in figure 4-28, The mechanical advantage of the single is 3, whereas the mechanical advantage of the double is 5. A twofold purchase consists of two double blocks, as shown in figure 4-29, whereas a threefold purchase consists of two triple blocks, as shown in figure 4-30. The mechanical advantage of the twofold purchase is 4; the advantage of the threefold is 6. In reeving a simple tackle, lay the blocks a few feet apart. The blocks should be placed down with the sheaves at right angles to each other and the becket ends pointing toward each other. To begin reeving, lead the standing part of the falls through one sheave of the block that has the greatest number of sheaves. If both blocks have the same number of sheaves, begin at the block fitted with the becket. Then, pass the standing part around the sheaves from one block to the other, making sure no lines are crossed, until all sheaves have a line passing over them. Now, secure the standing part of the falls at the becket of the block containing the least number of sheaves, using a becket hitch for a temporary securing or an eye splice for a permanent securing. With blocks of more than two sheaves, the standing part of the falls should be led through the sheave nearest the center of the block. This method places the strain on the center of the block and prevents the block from toppling and the lines from being cut by rubbing against the edges of the block. Falls are generally reeved through 8- or 10-inch wood or metal blocks in such a reamer as to have the lower block at right angles to the upper block. 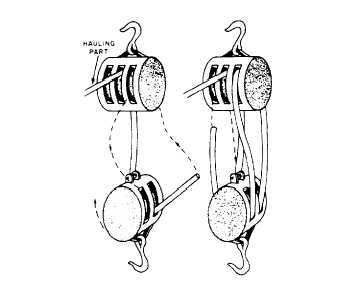 Two, three-sheave blocks are the usual arrangement, and the method of reeving these is shown in figure 4-31. The hauling part must go through the middle sheave of the upper block, or the block will tilt to the side and the falls jam when a strain is taken. 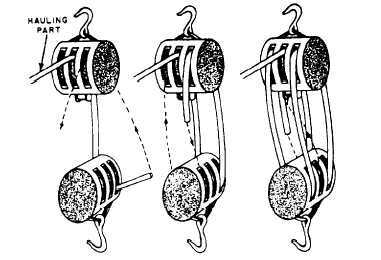 If a three- and two-sheave block rig is used, the method of reeving is about the same (figure 4-32), but, in this case, the becket for the dead end must be on the lower, rather than the upper, block. Naturally, you must reeve the blocks before you splice in the becket thimble, or you will have to reeve the entire fall through from the opposite end. Figure 4-31. - Reeving a threefold purchase. are parts of the fall on the movable block. Also, an allowance for friction must be made, which adds roughly 10 percent to the weight to be lifted for every sheave in the system. For example, if you are lifting a weight of 100 pounds with a tackle containing five sheaves, you must add 10 percent times 5, or 50 percent, of 100 pounds to the weight in your calculations. In other words, you determine that this tackle is going to lift 150 pounds instead of 100 pounds. Figure 4-32. - Reeving a double-luff tackle.